A sumptuous béchamel can turn the humblest of vegetables into a feast. A tangle of wilted bitter greens, a swathe of sauce and suddenly dinner isn’t so basic. I am partial to such creamed greens alongside grilled steak, or atop a baked potato. Knobby brassicas, such as Romanesco, cauliflower and broccoli, turn plush and sweet after a time beneath a béchamel blanket and need only a robustly crusty bread and a drop of chili oil as accompaniment. Here, onions start off braised in chicken stock; then, once they are soft enough to acquiesce to the sharp tip of a knife, they are cored and stuffed with a pork filling and returned to the steamy heat of the oven. 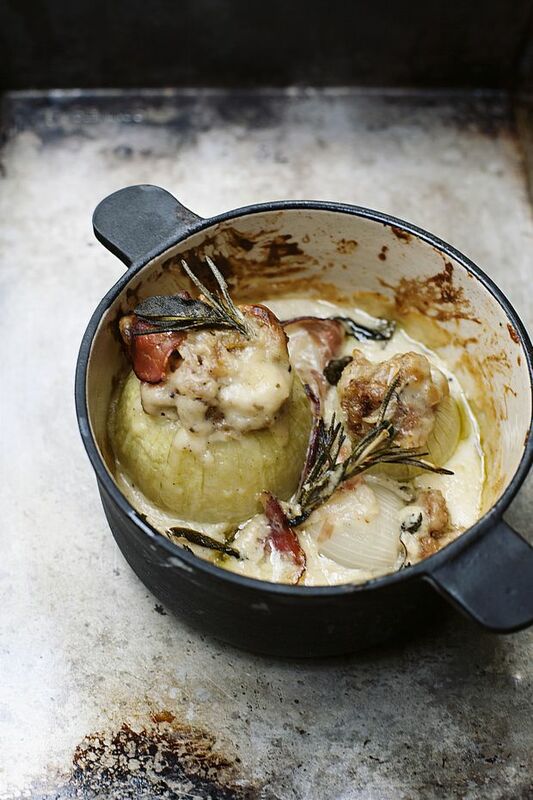 After that, enter the béchamel – technically a mornay, as there is cheese involved – spooned over the plumped onions, then oven-bound again so the filling cooks, the onions turn truly tender and the sauce mingles with the stock from the initial braise and the juices from the onions. In the end, with crisped ham for a salty counterpoint and a textural shift, the dish is the spoonable sort of comfort meal that I’m craving on these damp days. All it needs is a crisp, fresh salad on the table, or maybe some buttered noodles or fregola if a heartier meal is called for. I must say, it also feels industrious to make a meal mainly from a pantry staple such as an onion, a modest amount of meat, using up the spent Parmesan rinds I keep in the freezer. Once again, béchamel works its magic. Trim enough from the bottom of the onions to give them a flat base, but try to leave most of the root intact. Flip over and slice the top to expose all the layers; 3/4-inch or so. Remove only the thinnest peel from the outside. Set prepared onions aside in a baking dish that holds them snugly. Pour the chicken stock into the pan, cover with foil and bake until barely tender, 30 minutes or so. Pull the onions from the oven. Carefully peel back the foil and reserve. When the onions are cool enough to handle, use a melon baller or a small, sharp spoon, to hollow out their centres, leaving 2 or 3 layers on the outside and a sturdy base. Season the cavities. Chop the onion trimmings finely. In a medium pan over medium-low heat, warm the oil. Scrape in the chopped onion and sauté until thoroughly cooked and lightly caramelized, around 5 minutes. Stir in the garlic, and cook for 1 minute more. Finely mince the leaves from two of the thyme sprigs, one of the rosemary and two of the sage. Keep the remaining herbs for later. Stir the minced herbs into the onions. Add the breadcrumbs to the pan and season assertively. Take the pan off the heat and let it cool, then stir in the ground pork. Pack the mixture into the empty onions, re-cover with foil and bake for 10 minutes more. While the onions braise, make the béchamel. Melt the butter in a small, heavy-bottomed saucepan over medium heat. Once foaming, stir in the flour and cook for 1 minute. Whisk in the milk in a slow, steady stream. Bring to a boil over medium-high heat, whisking all the while. Then, turn the heat all the way down to maintain a simmer. Tuck in a Parmesan rind, if using, and stir in all the cheese. Season with kosher salt, freshly ground pepper and nutmeg. Keep on a low flame, stirring regularly, until the timer for the onion dings. When the onions are done their 10 minutes, remove the foil and discard. Pull the parmesan rind from the béchamel. Pour the sauce on and around the onions. Return the baking dish to the oven for 10 minutes more, then baste the onions with the sauce, strew the reserved whole herbs in the pan and drape the onions with torn slices of ham. Bake for a final 10 minutes, at which point the filling should be cooked all the way through – test this by inserting a skewer into the middle and feeling if it is hot – and the onions supple. If not, return them to the heat until this holds true. Let stand for five minutes, then serve.